You just have to try this turkey recipe for Christmas lunch! 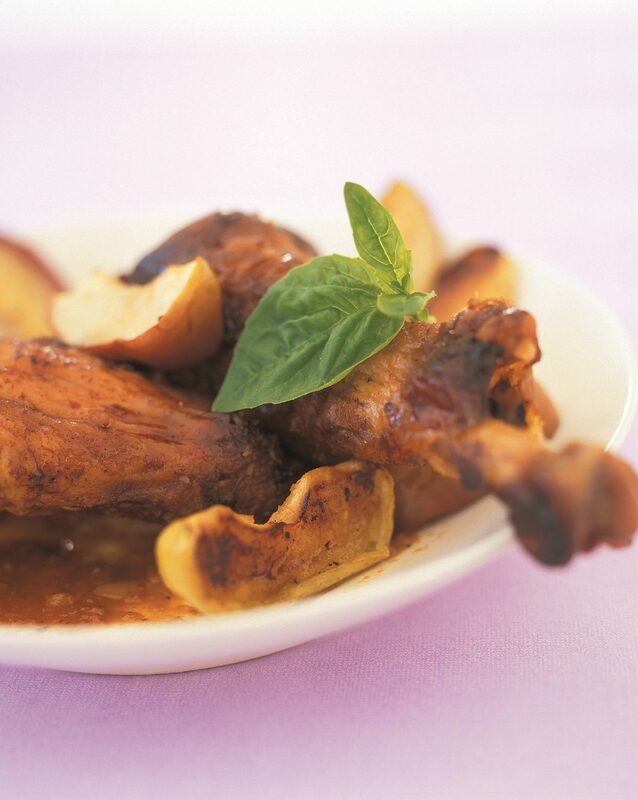 It’s crispy and golden and glazed with a roasted apple sauce. Succulent and quite delectable, everyone will be licking their fingers for more. Such an easy recipe to prepare, it can be made ahead and reheated so successfully. I just couldn’t resist sharing it with you. Place apple pieces in oven and season with salt and pepper and ginger. Drizzle with a drop of olive oil. Roast until well browned on both sides, shaking pan for about 30 minutes. Remove. Wash and dry the turkey well. Place it in the same roasting pan and season very generously with salt and pepper. Roast on 180°C for at least 1 ½ hours until well browned and golden on all sides. In the meantime, place orange juice in a pot and reduce on high heat until you have 1½ cups orange juice. Add the chicken cubes and apple sauce to the orange juice. Pour this mixture into the roasting pan over the turkey mixing it with the juices of the turkey from the bottom of the pan. Place the roasted apples back in the roasting pan and continue to cook the turkey for another 45 minutes. Should you need more gravy, add a little boiling water to the roasting pan. Add extra salt if desired. Carve turkey and serve sauce separately or spoon sauce over turkey to prevent it from drying out.